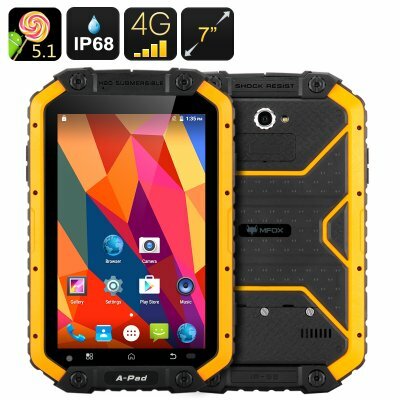 Successfully Added MFOX APad Rugged Tablet - IP68, 7 Inch 1280x800 Screen, Android 5.1, Dual SIM, Bluetooth 4.0 to your Shopping Cart. Watch movies, play games, browse the web and more outdoors even in the toughest weather conditions! The MFOX APad Rugged Tablet is IP68 waterproof and comes with a 7 inch screen, dual SIM, 4G connectivity, Android 5.1 OS and more. If enjoy hiking, camping or simply like or need to spend a lot of time outdoors, the MFOX APad Rugged Tablet is a great gadget to bring along. Here’s why. First, the tablet comes with an IP68 rating and that means it’s totally dust tight and can even be submerged in water. So, you will be able to have your tablet out in the rain – and even if it falls in the water, you won’t need to get a new one. The second thing you really want in the big outdoors is staying connected. The MFOX APad Rugged Tablet comes in super handy here as well. It comes with 4G connectivity and supports two SIM cards. So, you basically have yourself a second smartphone – a rugged phablet – for use outdoors. You will also have Bluetooth 4.0 for hooking up the tablet to other devices, like external speakers, Bluetooth headsets and more. With Android 5.1, you will have a great useful interface at your fingertips and access to the Play Store, where you can get more fun apps, tools and games. The 7 inch screen with 1280x800 resolution is compact and makes the tablet easy to carry around while at the same time lets you enjoy your media in great quality. The tablet comes with a 6000mAh battery and you will have up to 17 hours of continuous use and 320 hours on standby. So for those adventurers who love their gadgets just as much as the great outdoors this is the perfect tablet for all your needs. The MFOX APad Rugged Tablet comes with a 12 months warranty, brought to you by the leader in electronic devices as well as wholesale Android rugged tablets..
English manual can be downloaded from our webpage.